A GREAT ACTIVITY FOR ASPIRING TEENS! What we think about and focus on expands, whether it’s the problem of the day or the gift of gratitude. Is there something in your life that you’d like to have more of; joy, fun, lightness, laughter, confidence, love, business success? One of the most valuable ways of achieving your dreams and aspirations is through visualization. Our mind doesn’t know the difference between reality and make believe and, harnessing this to our advantage, we can draw into this present moment the emotional state of our end goal. When we live "as if" right now, the Universe conspires to make it true. 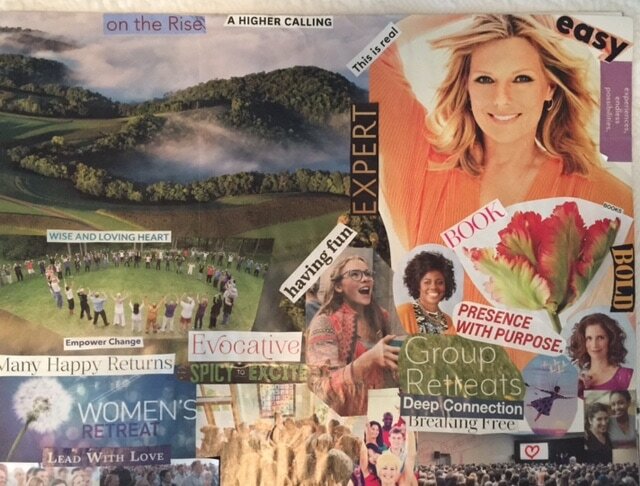 With vision boards, we turn on this emotional mindset. These inspirational collages empower pictures, words, quotes, and mapping to create a visual representation that draws us in every day. Our mind responds strongly to visual stimulation and activates the Law of Attraction. Allow subconscious structural tension have desires and dreams come true. So let’s come together and have lots of fun with the Inspiring Your Life Vision Board workshop. Align your body and mind to move forward towards your best self, activating the positive and uplifting emotions of your desired state every day.